Since I’ve banned sweets from our house, we have been missing something yummy for dessert. I thought I’d try making a healthy ice-cream to compensate. Credit to my mother-in-law for the idea to use bananas in this recipe. They give it the creamy texture you would normally get by using dairy products but without having to use dairy products. It’s a great idea! You can also substitute frozen blueberries for something else if you prefer. Blueberries just happen to be my favourite. Put everything into a bowl and then mash it all together with an electric hand blender. Pop it back in the freezer for an hour or two, then eat! 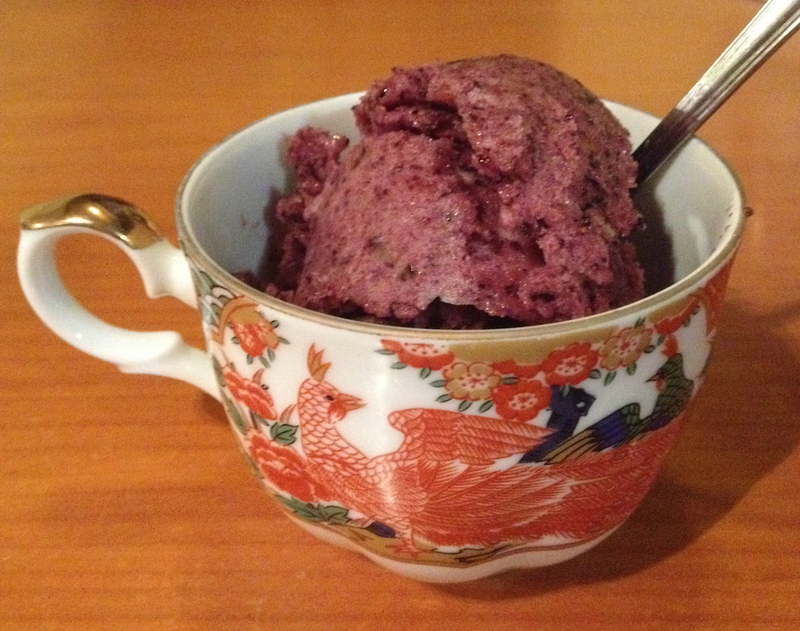 Posted in Recipe and tagged blueberry, dairy-free, ice-cream, recipe, Vegan. Bookmark the permalink. Pretty colour and very surprised to see it didn’t contain cream or sugar! Raspberries would probably look even nicer and I expect they’d give it a nice tart flavour too. I might try those next time. Just made it with fresh strawbs (well, it’s California), plus maybe a cup of (unsweetened!) soy milk to thicken it slightly since strawb pulp is thinner than bloob pulp. The spoon was licked and it was judged tasty, although I expect it will be yet more satisfying in its frozen state. I expect I’ll be using this recipe a lot, likely with honey substituted for the maple syrup. Next: Papaya-mango! Thank goodness no sugar, except for, um, every one of the ingredients. Picky! I’m glad the first taste was satisfying. Papaya-mango sounds like a great combo. I’ve just made a chocolate-peanut butter version and it is very yummy. I’ll post the recipe later.